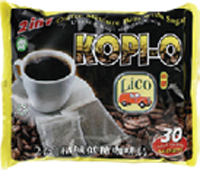 Syarikat Lee Gaik Khuan was a sole-proprietorship then in the line of business producing coffee powder. As the founder of the business, the late Mr. Lee Gaik Khuan started out in the year 1948 on a small scale, making sales in his red motorcar, and traveling all the remote areas and villages around the district of Selama in Perak. In the year 1954, the business moved from Selama to Permatang Pauh in the district of Seberang Perai in Penang. Business operation, spearheaded by Mr. Lee Yap Bing, the eldest son of the second generation, then resumed in a factory with a size of 3,000 square feet. The factory was expanded to over 5,000 square feet in the size in the year 1963 when the company ventured into the spices industry. By the year 1995, the progression of business came into the third generation which converted the business into a private limited company. With a factory size of over 35,000 square feet and offering employment to a workforce of 45 personnel, the company continues in the business of producing coffee powder and spices to this day. It is with joy and pride that the company in the year 2008 celebrated its 60th Anniversary since its inception in 1948. 1261, Permatang Pauh, 13500 Seberang Perai, Penang, Malaysia.